We know that there are four type of forces that act on an aircraft. Now we will discuss these forces in detail. In this post we will discuss how these forces generate and how these forces are controlled by the pilot. As we know there are mainly four forces acts on the aircraft whose position and direction can be understand by following picture. In the picture all the forces are shown acting on the aircraft in the different direction. Before discussing the four forces first we should know the two types of forces in the aircraft. These types are artificial force and natural forces. Artificial forces are those which would be generated by pilot during flying operation and natural forces are those which is naturally generated. Lift is a force that acts at vertical upward direction. This force is developed through the wings. And it can be manipulated by varying the angle using flaps. When the aircraft has to climb then the lift would be greater than the weight and when the aircraft has to go down then the lift would be less than the weight. So it is an artificial force that can be controlled by pilot. It act opposite to the weight of the aircraft. In cruise condition of the aircraft, the lift force is equivalent to the weight force of the aircraft. In the aerofoil, when the air strikes to the leading edge of the wing the air bifurcates. Which means the portion of air goes up and part of air goes lower side of the wing as shown in figure. The part of air which goes upper side of the aerofoil has to travel more distance than the distance travelled by the air at the lower side of the aerofoil. The air at the upper side of the wing has to increase its velocity to reach out to the air at the lower side at the same time while leaving the aerofoil. The aerofoil concept is an application of Bernoulli’s theorem. This theorem also tells us about the relation of velocity and pressure. As there is a velocity difference in the aerofoil. So there would also be the pressure difference. The pressure would be less where the velocity is more and the pressure would be more where the velocity is less. So the pressure at the upper side of aerofoil would be less than the pressure at the lower side of the aerofoil. Because of this pressure difference the system lift to the upper side. So here the process completes to produce the lift force by the aerofoil. 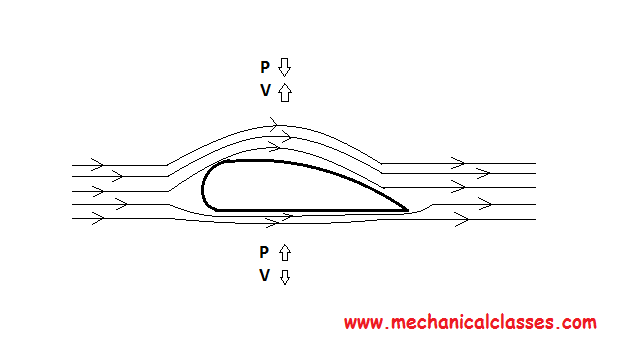 Thrust force acts horizontally at the direction of the motion of the aircraft. This force is generally generated by the engines and can be controlled by the pilot. So it is an artificial type of force that acts opposite to the direction of the air flow. This force provides the forward motion to the aircraft. To vary the speed of the aircraft this force is very crucial. The thrust force can be manipulated to control the speed of the aircraft. Thrust force opposes the drag force so the in the cruise condition the thrust would be equivalent to the total drag acting on the aircraft. Thrust force generates through the engine of the aircraft. In the engine fuel is used to generate the energy. The fuel is mixed with the air and the combustion of this air fuel mixture would take place to generate the required energy. The energy would be used to produce the forward horizontal force to move the aircraft that is called thrust. This force is the total weight of the aircraft. It acts vertically downward in the plane. It is a natural force and cannot be manipulated. This force opposes the lift force. So in cruise condition the weight of the aircraft should be equal to the lift produced in the aircraft by pilot. As the weight cannot be varied so the lift would be manipulated by the pilot to control the altitude of the aircraft. 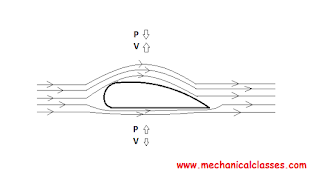 Drag force is a type of frictional force that is generated due to air resistance in the aircraft. This force is partially artificial because it can be partially manipulated but cannot be eliminated completely. This type of drag occurs due to the lift generated in the aircraft. 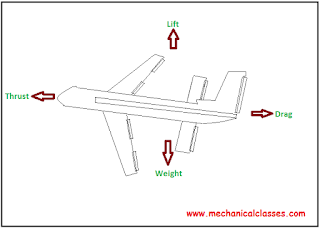 This drag is the horizontal component of lift while vertical component is used to lift the aircraft. The drag due vortex generation also comes under category of induced drag. This type of drag mainly includes drag due to friction. When solid body moves through a fluid then this type of friction force generates. In the parasite drag many types of drag are included such as form drag and skin friction. Form drag generates due to viscosity of fluid. The viscosity of fluid creates the pressure drag. And skin friction is the drag due to roughness of solid body.